LOCATION: Captain George Vancouver statue, City Hall, 453 West 12th Avenue, Vancouver. The ultimate expert on all historical matters pertaining to Vancouver, Chuck Davis, routinely asked students in Vancouver area schools to name the person who this statue behind City Hall represents. His listeners always guessed it was George Washington. In this way Chuck Davis could kindly begin the process of educating his audiences as to how little they knew about their city. As a congenial radio host, quizmaster, newspaper columnist, author and master gatherer, Chuck Davis continuously popularized B.C. history from the publication of his magnum opus, The Vancouver Book (1976), until his death in 2010. Once upon a time, there was a crusty, cranky, self-inflated, Welsh-born, New Zealand–raised amateur historian in Kitsilano named Major James Skitt Matthews who, having fought at Ypres in WWI, insisted he should be empowered to serve the City of Vancouver, both officially and unofficially, as its chief historian for almost 40 years. Matthews interviewed pioneers, including the namesake of his neighborhood, August Jack Khahtsahlano, and remained fiercely protective of his work until his retirement at age 91 in 1969. He died a year later. Chuck Davis died at Surrey General Hospital of lung cancer around 6 a.m. on November 20, 2010, three days after his birthday, survived by his wife and daughter. On May 5, 2012, Chuck Davis was posthumously honoured with the Lieutenant-Governor’s Medal for Historical Writing for his final book The Chuck Davis History of Metropolitan Vancouver (Harbour Publishing 2011 $49.95). Davis had described this magnum opus as “the capstone of my writing career.” On the following Saturday, May 12, the book that Chuck Davis considered to be “the capstone of my writing career” received the Roderick Haig-Brown Regional Prize and the Bill Duthie Booksellers’ Choice Award at the Djavad Mowafaghian Cinema in downtown Vancouver. 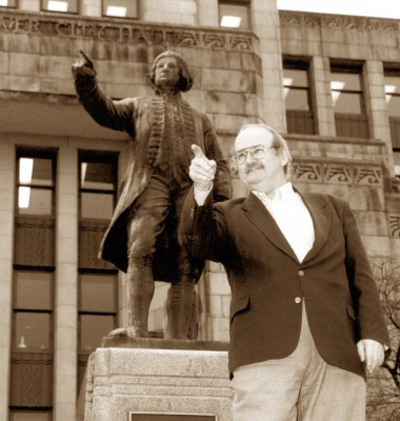 Chuck Davis with the statue at City Hall of Captain George Vancouver. Chuck Davis was easily the most knowledgeable person about Vancouver. As a congenial radio host, quizmaster, newspaper columnist and author, he continuously popularized B.C. history. Most notably, he compiled and edited The Vancouver Book in 1976, followed by an 882-page omnibus called The Greater Vancouver Book in 1997. The latter was co-produced with John Cochlin. The monumental publishing enterprise with Linkman Press proved disastrous on a personal level (“Memo to self: never publish, only write.”) but Davis’ massive reference work has only been eclipsed by the Encyclopedia of British Columbia as the most essential reference work about B.C. An unstoppable collector of information, Davis worked for many years on The History of Metropolitan Vancouver destined to be ‘the Mother of all Histories of Greater Vancouver’. He was in broadcasting for more than 30 years, beginning with the Canadian Army radio station, CAE, in Werl, West Germany in 1956. He married his wife Edna in 1965. They have one daughter, Stephanie, born in 1972. And he played killer Scrabble. After 66 years in Vancouver, having arrived at age nine, he had interviewed an estimated 2,800 people. In October of 2010, Davis was diagnosed with terminal cancer but was determined to complete his most ambitious project, the exhaustive, year-by-year omnibus to be published as The History of Metropolitan Vancouver. “I don’t think there’s anyone more passionate about the city,” said former Vancouver Mayor Sam Sullivan. On October 14, 2010, at the Fletcher Challenge Theatre at Simon Fraser University’s Harbour Centre campus, Chuck Davis received the 17th annual George Woodcock Lifetime Achievement Award for an outstanding literary career in British Columbia from Vancouver Mayor Gregor Robertson at an event coordinated by Alan Twigg of B.C. BookWorld in conjunction with the release of Twigg’s book, The Essentials: 150 Great B.C. Books & Authors. Approximately 200 people attended the ceremony, including many of the province’s foremost authors and publishers. Palace of Entertainment: The Orpheum Theatre — manuscript, never released. The Vancouver Book (General Editor) (1976) J.J. Douglas Ltd.
Chuck Davis’ Guide to Vancouver (1973, 1975) J.J. Douglas Ltd.
2012 Lieutenant-Governor’s Medal for Historical Writing for The Chuck Davis History of Metropolitan Vancouver (Harbour Publishing 2011). 2012 Roderick Haig-Brown Regional Prize for The Chuck Davis History of Metropolitan Vancouver (Harbour Publishing 2011). 2012 Bill Duthie Booksellers’ Choice Award for The Chuck Davis History of Metropolitan Vancouver (Harbour Publishing 2011). 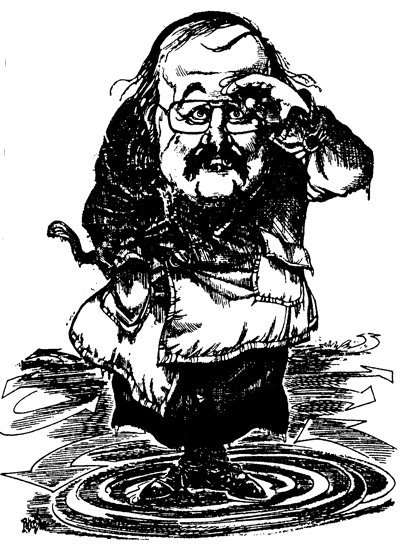 Chuck Davis drawn by Roy Petersen. Chuck Davis has been told it is time to write his final chapter. The 74-year-old author met last week with an oncologist who delivered a grim verdict. His cancer was incurable. Radiation and chemotherapy were out. Nature was to take its unforgiving course. In the dizzying aftermath, Mr. Davis realized he had not fully absorbed the prognosis. His wife and daughter, who had accompanied him, filled him in on the unhappy details. These he shared just two days later with an audience at the Vancouver Playhouse Theatre organized by former Vancouver mayor Sam Sullivan. The long-time radio announcer asked to be the final speaker on the program. He stepped on stage in his usual wardrobe of a rumpled shirt and well-worn sweater. Speaking in familiar dulcet tones, apologizing that his illness has made him less stentorian than in his days as a CBC staff announcer, he related his recent meeting with the doctor. “I don’t recall hearing the word ‘years,’ ” he added. He was sharing the “embarrassing and intimate details” of his health for one desperate reason – he needs help in finishing a massive history of the city he has chronicled all his adult life. He announced that he was seeking $30,000 to pay a writer to complete the project. A man of boyish curiosity, Mr. Davis has been a radio host and a quizmaster, an author and a newspaper columnist. Along the way, he earned a deserved reputation as Mr. Vancouver. “Just like you,” the man replied. That Mr. Davis repeats the story shows his good humour. He has an insatiable appetite for facts and a storyteller’s gift for finding the ironic, the interesting and, especially, the humorous in even the most ordinary details. Typical of his style is a tidbit about the city getting the first mechanized ambulance in the land in 1909. The crew proudly took the ambulance on a tour in which they accidentally struck and killed a pedestrian. He has posted thousands of such facts, from the mundane to the macabre, at www.vancouverhistory.ca. When not haunting the library or the archives, Mr. Davis works from a cluttered office at his Surrey home, a four-fingered typist immersed in what has been described as “the world’s largest gerbil nest.” Flat surfaces are covered by stacks of paper. Hundreds of files fill four cabinets. In the coming months, he needs to complete a commissioned history for the Association for Mineral Exploration British Columbia (“formerly the B.C./Yukon Chamber of Mines,” he added helpfully). With a centennial in 2012, the book has a fixed deadline. So, too, does its author. As for the Vancouver history that was to be his magnum opus, Mr. Davis seeks a writer to complete the long-overdue manuscript for delivery to Harbour Publishing of Madeira Park, B.C. At the conclusion of his address to the salon, Mr. Davis’s voice cracked and he choked up. As he left, the crowd rose in salute, a tribute that went unseen by him. It is also his cruel fate that he likely will not see the publication of a book that will tell the people of Vancouver more about themselves than they ever knew. 2010 CTVglobemedia Publishing Inc. All Rights Reserved. Used by permission of author. VANCOUVER — Chuck Davis, the man who produced the definitive guide to Vancouver, along with 14 other books, has died from lung cancer at age 75. His wife, Edna said he died early Saturday morning before 6 a.m., in an e-mail. When contacted at home, she declined to talk about her husband just yet. “I’m just not prepared for that right now,” she said. She said the family plans to have a memorial and celebration of his life in about two months. Tributes to the highly respected historian and author poured in Saturday, as friends called to talk about the enormous contribution he made to Vancouver. “Chuck gave so much as a selfless civil servant. He was like a civil servant. He was gathering all this information not for his own self but for the sake of society,” said Alan Twigg, publisher of BC Bookworld. Paul Whitney, city librarian at the Vancouver Public Library, who knew Davis for several decades, said he was a well-known figure at the library who will be sadly missed by staff. For longtime friend and civic historian John Atkin, it was Davis’s unwavering passion for unearthing rare tidbits from the library archives on Vancouver’s history that he will remember the most. “You’d bump into him in the archives and he would be super exited about finding a Vancouver Board of Trade minute from the 1890s,” he said. Davis announced he had incurable lung cancer in September and had only weeks to live. A self-taught intellectual, Davis was in the midst of writing The History of Metropolitan Vancouver, which he described as “a big, fact-filled and nicely readable book” on the history of Vancouver. He had also created a website of the same title that covered everything from Bowen Island east to Langley. Apparently, he also played a mean game of Scrabble. The Vancouver library had just finished putting the plaque with the award in the pavement at the north plaza on Friday. On Saturday, Vancouver Mayor Gregor Robertson issued a statement offering condolences to his friends and family and praised the legacy of Davis’s accomplishments. “His work as a broadcaster, educator and prolific author instilled a sense of local history and heritage in our citizens. Chuck showed why our past is so important and brought it to life in so many different ways,” he said. Not only did Davis dedicate his life to own writing, but according to his friends he spent countless hours helping others with their work. Atkin lamented that he’ll miss swapping e-mails about historical facts, sometimes as late as 2 a.m.., while another colleague Gord Lansdell, creator of Northwest Broadcasters, said they would often meet up at the library to discuss work. “He was extremely helpful to me with my writing of radio history, and it was he who suggested I start the Vancouver Broadcasters website to help with contacts,” he said. Born in Winnipeg in 1935, Davis worked as an author, newspaper columnist, radio announcer and TV producer since getting his start at the Canadian Army radio station in West Germany after joining the Princess Patricia’s Canadian Light Infantry in 1953, he wrote in his official biography for the bcradiohistory.com website. His first newspaper story — on how to construct crossword puzzles — appeared in The Vancouver Sun in 1966. His first book, a guide to Vancouver, was published in 1973 and The Vancouver Book was published in 1976. According to Twigg, his subsequent book The Greater Vancouver Book, published in 1997, was a financial disaster. But even that didn’t stop him from taking on another massive project with The History of Metropolitan Vancouver. Davis is survived by his wife Edna, whom he married in 1965, and their daughter Stephanie. To listen to Chuck Davis talk about his life in radio, click here to go to bcradiohistory.com and follow the main link. Whether you remember him as “Mr. Vancouver,” the city’s “collective memory,” a prolific author, broadcaster, quizmaster, fact-hoarder, Scrabble wizard, or just plain Chuck, it’s clear from the dozens of articles lamenting Chuck Davis’ recent death that he was, and will remain, a Vancouver icon. Chuck is best known for his definitive guide to Vancouver, The Vancouver Book, and its follow up, The Greater Vancouver Book. And in the years leading up to his death, Chuck was working on his magnum opus, The History of Metropolitan Vancouver. The book represents the culmination of his life as a folk historian, someone who was obsessed and delighted by all things Vancouver, and of his immense contribution to our historical knowledge of the city of Vancouver. It was nearly, but not quite completed before his death this November. Harbour Publishing worked with Chuck on The History of Metropolitan Vancouver for the past five years, and plans to see it finished and published in time for next year’s 125th anniversary of the city, as was the author’s plan. The independent publisher, based out of Madeira Park on the Sunshine Coast, is collaborating with the Vancouver Historical Society—a non-profit society established in 1936 that promotes public interest in Vancouver’s history, historical research and publication, and the preservation of historic sites. Together, they have created the Chuck Davis Book Fund to raise the money necessary to reach this goal. Earlier this year, Chuck Davis was honoured with the George Woodcock Lifetime Achievement Award for his literary contributions, and by the City of Vancouver, which named an official Chuck Davis Day. To make a contribution to the Chuck Davis Book Fund please send your cheque, made out to the Vancouver Historical Society, to Harbour Publishing (PO Box 219, Madeira Park, BC, V0N 2H0). Donations over 100 dollars will receive a tax credit. For more information, call Harbour Publishing at 1-800-667-2988 or email info@harbourpublishing.com. Join journalist Allen Garr, broadcaster Red Robinson, musician Dal Richards & others to celebrate the launch of The Chuck Davis History of Metropolitan Vancouver ($49.95, Harbour Publishing) at the Vancouver Public Library—350 West Georgia Street, Vancouver—on Tuesday, December 6th at 7:00 pm. What was happening in Vancouver during the Great War, when the Titanic sank, at the height of the Depression or the announcement of the lunar landing? Are we much changed since 1896 when City Council sanctioned a maximum of 25 cows per owner in the city limits, while today we squawk about how many chickens we can keep in our backyards? In The Chuck Davis History of Metropolitan Vancouver, the city’s 125 years is put on display. Change was fast in Vancouver’s beginnings; the first schools, bridges and hospitals sprouted quickly. However, quantum leaps in growth were not without some growing pains. >From natural disasters like the Great Fire of 1886 and the Great Flood of 1894, to social disasters like the anti-potlatch law, Vancouver suffered many setbacks for all of its progress. Davis’s exuberant storytelling offers a light-hearted hope that this is a city that learns from its mistakes—when the Great Fire cremated the city in a reported 20 to 45 minutes, Vancouver’s first fire engine was ordered a week later. However, the book is equally fascinating for those revelations of what has not changed in one and a quarter centuries—forty years ago, the city rioted over pot. Today, it’s over a Cup. For the Lieutenant Governor, it was a case of déjà vu all over again—twice—at the 28th annual B.C. Book Prizes. First, on May 5, The Honourable Steven L. Point presented the Lieutenant Governor’s Medal for Historical Writing to The Chuck Davis History of Metropolitan Vancouver in the beautiful Campbell River Museum. Then, on the following Saturday, Point was on-hand when the capstone of Chuck Davis’ career received the Roderick Haig-Brown Regional Prize and the Bill Duthie Booksellers’ Choice Award at the Djavad Mowafaghian Cinema in downtown Vancouver. Three wins in three races. Davis’ double victory for his 574-page bestseller on was, as they say on the Sports Channel, the highlight of the night. Edna Davis accepted the Haig-Brown Prize for her late husband at the outset of the Book Prizes portion of the evening, and Davis’ publisher Howard White accepted the Booksellers Choice Award about an hour later. Here are publisher Howard White’s remarks upon acceptance of the 2012 Bill Duthie Booksellers Choice Award. This makes this book an all-around winner. It wasn’t always clear this would be the case. Chuck first brought the idea to me about ten years ago, planning to have it done the next fall, but he extended the deadline so many times and the mass of his researches began to mount up to such a daunting bulk I despaired of him ever finishing and worried it would run to ten volumes. Typical Chuck. Never stuck for line. Chuck dedicated himself to saving Vancouver’s stories but he was one of our most remarkable stories himself. The product of a broken home, he spent part of his childhood in a home for foundlings. He became one of BC’s most ubiquitous media personalities, but his first appearance in the media came as a waif left homeless when the Burnaby shack he and his father had been squatting in burned. He had only an elementary school education but became Vancouver’s most popular historian. Chuck was a born again historian. He saw the light one day when he was driving to work across the Burrard St. bridge, as he said, for about the 10,000th time. He looked at those peculiar decorations, the twinkling stained-glass lanterns, the half-boaty things, one labelled V and the other labelled B and realized he’d been looking at them for years but never actually seeing them. This day, for some reason he saw them, and he said to himself, now those are very weird things. No other bridge has anything like them. There must be a story here. So he went straight to the archives and found that indeed there was a story, and it was a good one. The lanterns commemorated WWI POWs, who kept themselves warm by lighting fires in barrels, and the boaty things represented the ships of George Vancouver and Harry Burrard, although as Davis harrumphed, Burrard never came within 5,000 km of this area. And no, the cozy-looking little buildings atop the arches never held exclusive apartments or sentries quarters; they merely cover up a bunch of unsightly steel girders. But yes, the odd tunnels in the piers underneath the car deck were intended to carry a second deck for a railroad, which was never built. Chuck wrote about his discoveries in his column in the Province and it went over so well he kept on researching and kept on writing. In the course of this he discovered two things about local history. One, it was just bristling with fascinating stories. Two, they were for the most part languishing unnoticed in the archives, just like his decoding of the Burrard Bridge. As one of BC’s most versatile and ubiquitous media figures, Chuck was well positioned to do something about this, and he dedicated the rest of his life to making us all aware of the rich treasury of stories contained in our own local past. He wrote 194 more columns revealing more hidden gems and added 18 books including three enormous reference works that would individually count as life works for many writers. Sometimes he despaired. Once he was delivering a slide show to a class of grade four, five and six students and put up an image showing the statue of Captain George Vancouver, which stands in front of City Hall. “Who can tell me who that man is?” he asked. He wondered if this was some kind of an anomaly and made sure to ask the same question at every school he went to. Out of forty-nine schools he visited all over metropolitan Vancouver, only once did he encounter a student who could identify the man after whom Vancouver was named. One honour he did not live to see was perhaps the most important one and that was from the people of BC. When this book which Chuck described as the capstone of his writing career finally reached the stores in late November of 2011, the people he had sometimes worried were not paying attention to his message voted with their feet and flooded into the stores in unprecedented numbers, opened their wallets and bought out the entire print run in one week. Then they bought out the second print run in two weeks. Several veteran booksellers said The Chuck Davis History of Metropolitan Vancouver was the fastest-selling book large hardcover they’d ever seen. It sold over 10,000 copies in six weeks. Not only did this show beyond any doubt that BC people are interested in their own stories, at least when they’re presented with style and humour and drama the way Chuck did, it shows something also of interest to those of us gathered here tonight, and that is that at this late date there is still tremendous support in this province for that wonderful artefact known as the printed book. Thank you Chuck, for reassuring us on that point, and thank you, BC booksellers for this recognition. 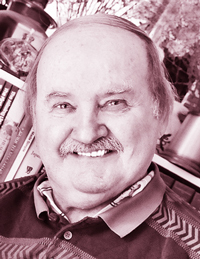 Chuck Davis, congenial radio host, quizmaster, newspaper columnist and author, has devoted his life to being the expert on the city of Vancouver’s history and its environs. His landmark volume, The Vancouver Book (1976), for which he was listed as general editor, was long regarded as his foremost accomplishment, even though it was eclipsed in size by his 882-page omnibus, The Greater Vancouver Book (1997), co-produced with business partner John Cochlin. Davis chose to self-publish the latter; and ultimately, it was this choice that denied him commercial success comparable to that of the former. In this essay that originally appeared in the Summer 2002 issue, Davis recalls in candid and humble detail the self-inflicted self-publishing detour that led him from Easy Street to Nightmare Alley. Something strange happened to me on the morning I started writing this. I was reading Deena Rosenberg’s book Fascinating Rhythm, about George and Ira Gershwin. It describes the piano in the center of the room, one of George’s favourite Steinway grands, where the brothers wrote all the songs from Porgy and Bess. I imagined standing in that room, awestruck, when suddenly and alarmingly I found myself blinking back tears. I put the book aside, swallowing repeatedly to erase that ugly and unexpected little spasm of self-pity. The vision of the Gershwin brothers excitedly moving around that piano, George humming and playing new melodies, Ira creating those wonderfully smart lyrics, both men jauntily writing down their work, contrasted so painfully with my own agony of recent years, trying to create while eaten by worry and fear. For four years I have been in the middle of a financial nightmare, caused by my creation of a book – my 13th – called The Greater Vancouver Book. That book drove my partner into personal bankruptcy; created an instant army of angry unpaid contributors; and saddled me with a debt. I have been paying off that debt at an average of about $500 a week and I will be paying for many years to come. That debt takes every cent I make, and I survive only because of my loving, generous (and steadily working) wife of 36 years. I’ve asked her not to read this article if it runs. It would be just too damned painful. How did a project that was going to put us on Easy Street dump us instead into Nightmare Alley? How did I come to have unpaid contributors snubbing me on the street, threatening to sue, and writing us nasty letters, including an anonymous “Merry Christmas” greeting scrawled on a piece of used toilet paper? Return with me to 1993. I was working on Top Dog!, the history of CKNW. When that work was finished, immeasurably faster thanks to the computer assistance of John and Kathy McQuarrie, we talked about a possible new project. Out of that discussion came the decision to launch The Greater Vancouver Book. I had wanted for years to expand my 1976 Vancouver Book, an ‘urban almanac.’ Every time I walked into Duthie’s the staff would ask when I was going to do an update. The book sold out, but the publisher (J.J. Douglas, now Douglas & McIntyre) declined to produce more because it had been too costly and time-consuming for them. I should have remembered that. Even at 500 big pages, I thought The Vancouver Book was too small. My inclination was, and remains, to get everything in. I even toyed, but only briefly, with the idea of including maps showing every building in the city. And I mean every building. I’m not entirely sane about stuff like this. My first major decision was that every article in the new book would be brand new and at least 1.5 times bigger than in the original, more subjects would be included, and the area covered would be not just the city but all of Greater Vancouver. Because of its size and expanded coverage, we’d call it an ‘urban encyclopedia’. I rashly announced I would write the entire book myself. It soon became apparent that wouldn’t work. I could do it, but it would take way too long. We’d calculated the project would take two-and-a-half years. With more than 200 contributors, it ended up taking four. So we needed more writers. How to pay them? Sponsorships, I said. There would be no advertising in the book, but pages and sections could be sponsored. We’d put what’s called “institutional” copy along the bottom of sponsored pages. My very first cold call resulted in sponsorship of the back cover by BC Gas! An old friend, adman Fin Anthony, advised me to double our fee schedule for everything. We discovered to our delight it made absolutely no difference. Sponsorships continued to pile up. We ended up with more than 200 sponsors. Many major companies signed on: Air Canada, BC Rail, BC Hydro, Canfor, VanCity, Finning, the Pan Pacific Hotel. I never got cocky but I was supremely confident that John and I were going to produce a blockbuster. By the end, Fin and I sold more than $300,000 in sponsorships. But a small cloud was beginning to form. The cost of the paper went up $40,000 while the book was in production. We were able to work out a contra deal with the paper company. But other costs of the book were rising steadily, far beyond what we’d expected. We could have saved thousands of dollars having the book printed in Hong Kong, but I said, “Hey, we can’t celebrate Greater Vancouver with a book printed in Hong Kong.” Gawd, I was stupid. Payment for these hard, practical things began to make it difficult to pay our contributors. The book couldn’t happen without production work, without paper and printing, so we had to give these items priority. We gave advances to many of our earlier writers, but then we started asking other to do the work on promise of payment. This was the 13th book I’d written, co-written or edited, but it was the first I’d ever published. To make a long and ugly story short, the total cost of the project was about $700,000 or so, meaning were short about $400,000 from breaking even. The book would have to sell really well to make that up. We were sure it would. The articles by our 200-plus writers – more than 20 of whom, by the way, had also contributed to the 1976 book – covered just about every aspect of life in metropolitan Vancouver. Their work was extensive, and fact-filled and (my favourite description of the book) useful. Constance Brissenden, for instance, worked for months on her list of 500 people of Greater Vancouver’s past. At 47,000 words it’s a small book in itself. Nothing like it has ever been done before, and I’m prouder of her work in the book than I am about any other writer’s. The book ended up a big, fat, fact-packed marvel. Late as it was, we were very proud of it. The first copies came out of the bindery June 11, 1997. The first review appeared in the Sun: the book was trashed. Thoroughly. The reviewer hated the articles, hated the cover, hated the paper it was printed on, she didn’t like this and didn’t like that, and on and on and on. It was a complete slash-and-burn job. Except for one thing: She had a kind word for Shane McCune’s article on Burn’s Bog. We’d tried to interest Business in Vancouver in our project because it was financed by local businesses, but the magazine never wrote a story. Then one day, after our real financial problems had started, we got a call from one of BiV’s writers who said he’d heard the book was in trouble. Now they were interested. I was so angry I could never bring myself to read whatever they printed. Still blinded by our prospects for the book, John and I sent out letters time and again telling our contributors they would eventually be paid. And time and time again we just couldn’t do it. Many times over these past four years I’ve received mail from writers that I didn’t have the heart, or the guts, to open, and phone messages I found difficult or impossible to reply to. The book did sell well but – in yet another example of my doltishness – I had arranged for 20,000 to be sold, at the full retail price of $39.95, that would be $799,000. Deduct the 40 per cent bookstore commission ($319,600) and that would leave us with $479,400. Add the sponsorhips to get approximately $779,000, deduct the $700,000 cost of the project and John/Kathy and I would split the hypothetical $79,000 net. That would be $39,500 to each of the partners for the work of four years, a little under $10,000 a year. Not quite enough for my dreamed-of four-door XJ6 Jaguar sedan. In the end, we sold 11,000, a couple thousand of those at a discount, all in one corner of the country. In terms of sales, The Greater Vancouver Book was a roaring success. But thanks to that “success,” John and I found ourselves in debt about a quarter of a million dollars. Visions of Samarkand and Machu Picchu faded, to be replaced by a sea of outstretched hands. The biggest hand belonged to the bank from which we had made a big loan to cover the unanticipated extra costs of producing the book. The second biggest was attached to the credit union at which I had arranged, for the same purpose, a second mortgage on our home. The most stressful fact in all of this mess is that I had no one else to blame. I had met the enemy and he was me. I vividly recall a night back in 1998 when I waited for the decision of the judges as to which book would win the City of Vancouver Book Award that year. I really wanted to win that award and the $1,000 that went with it. The Greater Vancouver Book did win, and the very next morning I rushed to the credit union with that $1,000 cheque, just in time to pay my mortgage. I decided not to go into bankruptcy because I knew virtually all of those writers. I didn’t want to go through what’s left of my life having to look aside in embarrassment when I met one of them. I’ve been told I could have declared bankruptcy, got some relief, and still paid them off down the road. But I just couldn’t do it. Just before I started writing this article, an event occurred that convinced me it had to be written. It was Wednesday night, September 5, at a Bard on the Beach performance of Taming of the Shrew (for which we had complimentary tickets). One of the book’s contributors was also in the audience, and when our eyes happened to meet there was a little flash of anger and contempt from her. What was painful about that particular occasion was that she was one of the really good writers, and had sent me a letter shortly before beginning her assignments complimenting me on the pay scale I had set. We offered writer an average of about $400 a page. Contrast that with the payment I got for writing three articles in the Canadian Encyclopedia: $45. Total. That is not a misprint. As a writer myself, one who has often been paid less than the work warranted, I wanted to do the decent thing. Now that angry writer is still waiting four years later for her money. She has lots of company. How many other contributors are out there, convinced we made a killing on the book? Some of the writers, knowing my financial situation, wrote me to say forget what I owe them. Such generous and compassionate responses are gratefully acknowledged, and will be resolutely ignored. I commissioned the work, they did they work, and I’ll pay for it. I would expect nothing less from someone who owed me money. Canada’s most famous war photograph is a heart-stopping moment captured by the Province’s chief photographer Claud Dettlof on October 10, 1940. As the British Columbia Regiment, Duke of Connaught’s Own Rifles, are marching off to an uncertain future in the European theatre of the Second World War, five-year-old Warren Bernard breaks away from his mother’s hand and rushes to grasp the outstretched hand of his father, Pte. Jack Bernard. The photograph, taken on 8th Street in New Westminster, was flashed all around the world within days. It appeared in Life Magazine, and has papered in newspapers, magazines and books beyond counting. It is a great photograph. And it was a happy ending: Jack Bernard returned from the war unscathed. He’s gone now, but his son Warren – ‘Whitey’ to his friends – lives and works today in Tofino. Following the Greater Vancouver Book, Chuck Davis worked for a local dot.com company, Stratford Internet Technologies, until it crashed. A second internet firm he worked for crashed. Then the city of Port Coquitlam hired him to write its official history, Port Coquitlam: Where the Rivers Meet (Harbour $39.95). The monthly installment of his fee exactly matched his monthly loan repayments to the bank. That book was published in 2000. Now he’s in trouble with the bank again. His former partner has arranged to have complimentary copies of the GVB distributed to schools. “That won’t help the writer and other contributes,” Davis says, “but it’ll get the book into more places where it will do some good.” In October, an Ottawa firm released Davis & McQuarrie’s collaboration Vancouver Then & Now (Magin Light $45), a 208-page, picture-rich look at physical changes in the city – printed in Hong Kong. Davis still hopes to write The Big One, the definitive book on the history of metropolitan Vancouver. “I won’t publish it, I promise.” – Ed.